There are several things you need to provide for your kids as a good parent. Clothes, shoes, foods, among other things, are very important provisions for your kids. However, some thins equally important but often overlooked are toys. While many parents often overlook the importance of toys, their importance to the daily mental development of your child is actually huge. Although, many parents ignore toys not because they don’t know about their importance, but because they deem it as unnecessary spending. Therefore, we have put together this list of the best cheap baby toys on the market. Although newborn babies don’t have any need for toys actually due to the fact the eating and sleeping are their primary concerns. However, as soon as your baby reaches 3 months old, you will begin to notice the surge in his interest in the things around him. If you have started noticing this about your child, then this is the perfect time to start introducing him to toys and fun activities that will keep him amused. But how do you know the right toys for your baby? This is where we come in. While there are several options for babies toys on the market, choosing the right baby toys for your kid is quite difficult. If you are looking to buy a toy that will go a long way in aiding the mental development of your child, then you must take certain factors into consideration. Keep in mind that toys play a vital part in helping your child to grow in different ways, therefore, you shouldn’t deny your kid that crucial opportunity. Cheap doesn’t necessarily mean bad while expensive doesn’t directly translate to good, as against what a lot of people believe. In this section, we will be reviewing some of the best cheap baby toys on the market that you can buy for your little ones. Although babies’ hearing begins to develop right in the womb of their mothers, when they are able to hear the heartbeat of their mom, but they usually have unclear vision at birth, and their vision only starts developing slowly when they are 3 months old. However, touch is fully function immediately after birth. 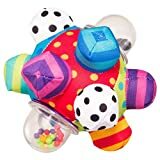 Undoubtedly one of the best baby toys you can find anywhere, the Sassy Developmental Bumpy Ball, is a phenomenal toy that helps babies in developing their hearing, sight, and touch. Designed to help the infant learn and practice their holding, throwing, and grasping skills, all the bumps have different colors, textures, and patterns. Besides, the ball has different colors that enhances the visual senses of the baby. With fascinating textures for the infant to explore, the Developmental Bumby Ball by Sassy is brilliant and beautiful. The bumps are the ideal size for babies’ small hands and the shake is an incredible diversion as well. It’s sufficiently straightforward to provoke the enthusiasm of little children and little crawlers will definitely love rolling and pursuing the ball. The enchanting Baby Einstein Octoplush is a uniquely built baby toy from all perspectives. It is a one of a kind toy that provides parents and guardians with the ideal chance to acquaint their children with an assortment of experiences established in nature, language, and music – a genuine baby multimedia experience simplified by a delicate, appealing toy. 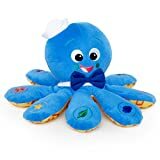 The Octoplush is intended to stimulate the vital and important play that improves the experiential world of a baby in a way that boosts positive growth. For a newborn to be healthy and happy, it is important for him to be associated with his parents and the outside world. Baby Einstein Octopush enables the child to grow emphatically as a result of the parental association it creates. Consider it as an instrument that enables parents to introduce their newborns to their general surroundings in ways that are both playful and engaging. Often called “The Winkel,” the Rattle and Sensory Teether Toy from Manhattan is an intriguing toy with loops capable of entertaining a newborn for an extensive period of time. Made out of plastic tubes of attention-grabbing colors, it won’t take long to notice this toy. Easy to hold and lightweight, small hands can grasp one of the rings easily and hold on for a long time. Your baby would be so captivated by this toy that you’d have to pry his hands open. Furthermore, this great toy can help improve baby’s motor skills via two-handed play. In addition, there is rattle at the centre of the toy which enables baby to massively develop whilst playing with the toy. It is really brilliant that it is a great teething toy as well. They learn while teething which is really incredible. Are you thinking about getting one yet? Don’t hesitate. Learn & Groove with 15 activities and over 40 songs and melodies! Activities provide opportunities for baby to explore with a roll, tap, slide or spin. Includes a variety of music styles for baby to enjoy. Comes with either blue or green legs to attach to table as baby grows. Introduces shapes, numbers and counting 1-10 in English and Spanish. Please insert new batteries for the item to produce the right sound. The batteries included inside the item are temporary for the "Try Me" feature. This is another award winning toy on our list. 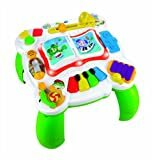 With the Leapfrog Learn & Groove Musical Table, learning, music, and fun are provided to you in a single package. You have the luxury to choose any song from the music catalogue of this toy. Your kid will likewise have an astonishing opportunity to learn the numbers, primary shapes, colors, alphabets, opposites, and play the piano. Besides, they will listen to nursery rhymes and sounds, groove to more than 40 songs and melodies and beat the drum. In addition, your kids will have the joy of listening to various languages like English and Spanish just by flipping a switch. The best and probably the most intriguing thing about this toy is that it can be adjusted according to the growth of your baby. This is due to the fact that very young babies sit flatly on the floor. As the baby grows, you adjust the height as well. More than 50 sing-along songs, words & phrases! 4 interactive crayons with lights and sounds sing as a quartet! Fisher-Price is a name that is almost synonymous with baby products, and with this great toy from the company, the reason for that is totally understandable. This is one of the best toys for babies from 9 months to 3 years. Thus, if your little one falls in these ages, you should definitely buy it for him. This toy cones with lovely features with three different fun levels that are educational. Each level coincides with the age and development level of your baby also. The toy comes with buttons for number learning, shape, color, and more than fifty songs, all sing along. This is an incredible toy that will enable your child to develop and grow in the correct path as he increases in age. Offers a wide range of songs. When choosing a cheap toy for your little one, there are a lot of factors you need to take into consideration. These factors will help you choose a cheap toy that is fitting, educational, and entertaining for the child. Buying an inappropriate toy for your child will create many different problems. First of all, it will not likely be engaging and entertaining for the child due to the fact that it is designed for younger or older kids. In the event that a toy is made older kids, a younger kid playing with such toy might be a bit unsafe. By choosing age-appropriate toys for your child, you can make sure that the toy was made specifically for the interests and needs of that particular age group. Of course, safety is a major concern as regard choosing new toys for children. Always make sure you pick toys that are well constructed, made from materials that aren’t toxic, and choose toys that are in one piece and don’t come with separate parts. You should also consider the material from which the toy is made as well. For younger kids, textured materials may help provide sensory enhancement and may have the child’s attention for a long time. When choosing toys for a child, regardless of the age, you should try as much as possible to choose durable materials. By so doing, you will rest assured knowing the toy is safe and will probably stand any kind of use your child might expose it to. Sometimes, price doesn’t determine quality and buying a cheap toy doesn’t necessarily mean it has to be of low-quality. When finding the right cheap toy for your kid, avoid cheap low quality toys. Toys that are of poor quality have a high tendency of breaking or getting damaged. Eventually, your kids will be able to choose the colors and styles they prefer. Before then, however, try sticking with the styles and colors that echo the gender of your baby as an infant and baby. When in the market for toys, you can’t fail to notice how several popular toys come in one style and color for boys, and another style and color for girls. It’s imperative for children to pick up the important developmental skills at every phase of their lives, and toys surely are an enormous help. Fortunately for most parents, babies’ toys don’t necessarily have to be expensive, and the toys reviewed above are very interesting and as well affordable. Just take the important factors we discussed into consideration and we trust that the buying guide above directs you in the right path to develop your baby. With the products we have reviewed, you not only have the most popular baby toys but also the best. While all of the toys have proven to be captivating for babies over the years, we think the Manhattan Toy Winkel Rattle and Sensory Teether Toy is the best. With its attractive design, great loops, and bundles of excellent features, this toy is sure to become your baby’s best friend.